Successfully architect a Drupal 8 website that scales to meet project requirements of any size and scope. Starting with a one-chapter review of Drupal basics, you'll dive into deeper topics including software development processes, architecting a Drupal site, scaling Drupal, working effectively with themes, and more. In addition to a thorough discussion of custom module development and how to develop modules as building blocks, you'll also review many common ways of integrating Drupal with other 3rd party systems. Building and maintaining an enterprise-ready Drupal website presents a unique set of challenges and complexities. From development processes and content management to deployments, version control and more, all aspects of Drupal development are impacted when two or more developers are on a project. If you are involved in a Drupal project that requires frequent updates and long-term support from a team of developers, system administrators, and end-users, Enterprise Drupal 8 Development is for you. 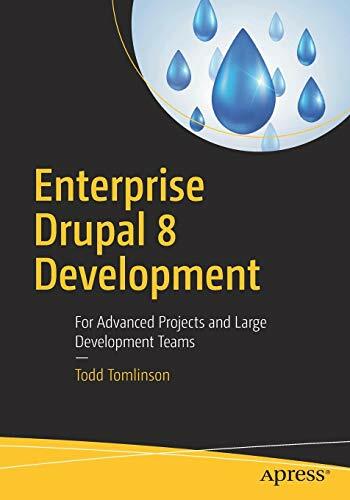 Whether you're an experienced Drupal developer looking to expand your skills, a systems administrator managing a Drupal project, or a PHP developer new to Drupal, Enterprise Drupal 8 Development will give you the knowledge and inspiration you need to manage large and complex projects.